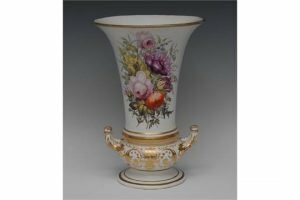 A Derby elongated flared cylindrical two-handled vase, well painted with summer flowers, the bulbous base with gilt Regency scrolls, circular base, banded in gilt. 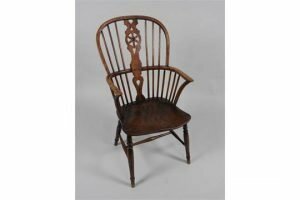 A mid 19th century elm and fruit wood high Windsor, with wheel pierced back splat over an elm saddle seat, on slender baluster turned front legs united by a turned H stretcher. 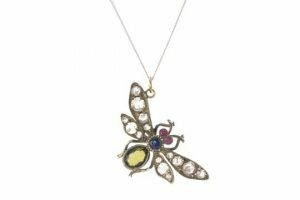 A diamond and gem-set insect pendant designed as a winged insect, the oval-shape green tourmaline and circular-shape sapphire body, to the rose-cut diamond wings and red-gem eye detail, suspended from a flattened curb-link chain. 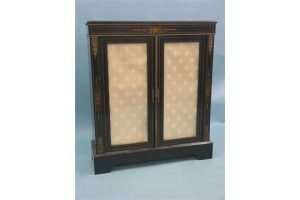 A Victorian ormolu-mounted pier cabinet, ebonized and inlaid in boxwood, pair of glazed doors enclosing a lined interior with two shelves, raised on bracket feet. 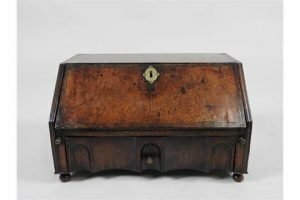 An 18th century & later walnut table top miniature bureau, the feather banded fall with oval brass key escutcheon opening to reveal five pigeon holes and one long and two short drawers, over two pull-out lopers and a shaped drawer to the base, raised on four later short turned feet. 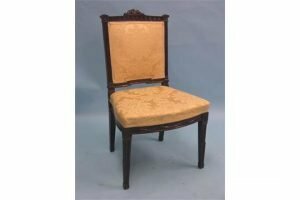 A 19th century mahogany single chair, top rail with leaf cresting, fluted uprights with Ionic capitals, upholstered in a yellow brocade. 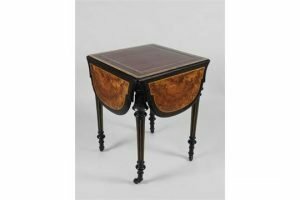 A late 19th century Aesthetic figured walnut and ebonized drop leaf centre table, with central tooled leather sciver within four arched dropped flaps, on four slender flouted tapering legs terminating in salt glazed castors. 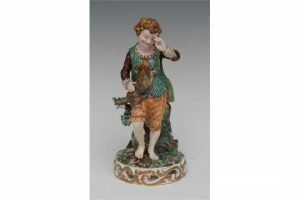 A Derby figure of a boy standing with a dog on his knee, wearing a brown and green collared jacket, striped waistcoat, brown and floral bloomers, on a pierced scroll base. 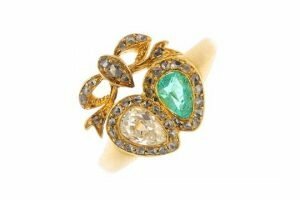 A late 19th century gold diamond and emerald ring, the pear-shape diamond and emerald, each within a diamond point overlapping surround, to the similarly-cut diamond bow surmount and tapered sides. Principal diamond estimated weight 0.30ct. 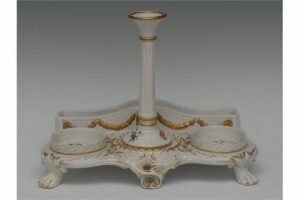 A Chelsea Derby shaped rectangular standish, in relief with rams head and gilt swags, the well apertures with colourful floral sprigs, raised on paw feet. 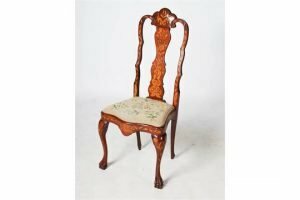 A 19th century Dutch mahogany and marquetry inlaid side chair, the shaped splat inlaid with an urn issuing flowers and foliage, above a needlework upholstered drop in seat, raised on cabriole supports with claw and ball feet. 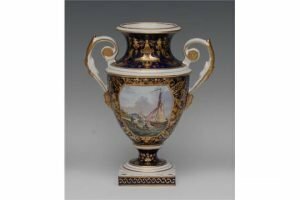 A Derby Named View two-handled pedestal ovoid vases, painted with On The River Elbe within gilt canted rectangular cartouche, the cobalt blue ground with gilt Regency scrolls, raised on a square plinth. 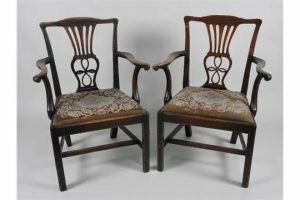 A pair of George III country Chippendale open armchairs, each with vase shaped pierced back splat over a later wool work cover drop-in seat, on square chamfered front legs united by a plain H stretcher. 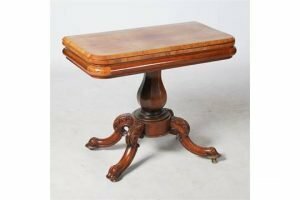 A 19th century rosewood pedestal tea table, the hinged rectangular top raised on an octagonal baluster column and four foliate carved down swept supports with brass castors. 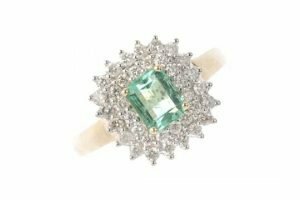 An 18 carat gold emerald and diamond cluster ring, the rectangular-shape emerald, within a brilliant-cut diamond tiered border. Estimated total diamond weight 0.50ct. Hallmarks for Sheffield. 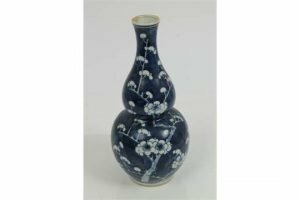 An early 20th century Chinese blue and white double gourd shaped vase, with painted prunus blossom on a blue ground – underglazed blue Hongxian four character mark to base and of the period. 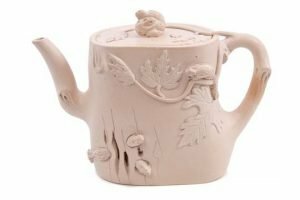 A 19th century Chinese Yixing cylindrical teapot and cover, decorated with vine leaves and squirrels with squirrel knop and branch handle and spout. 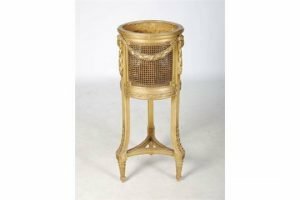 An Edwardian gilt wood jardiniere stand, the circular top with three cane work panel sides decorated with applied laurel garlands, raised on three fluted rectangular supports with acanthus carved detail and tapered cylindrical supports with spiral fluted detail, united by a concave triangular shaped stretcher. 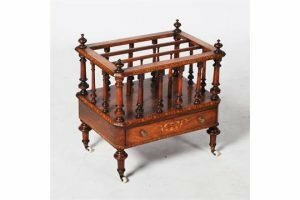 A Victorian walnut and parquetry inlaid Canterbury, the rectangular top with three divisions supported by tapered columns, above a single drawer, raised on tapered cylindrical supports with brass cups and white ceramic castors. 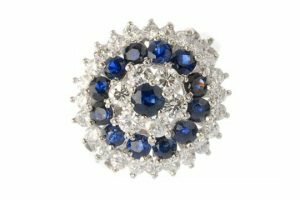 A sapphire and diamond cluster ring, designed as a circular-shape sapphire, within a similarly-set brilliant-cut diamond and circular-shape sapphire triple surround. Estimated total diamond weight 1ct.